The North Side Cable Cars, in close proximity to all the principal railway depots, pass directly before our door. The route traversed by the cable cars is plainly designated on the above diagram by dotted lines. Passengers can get aboard these cars at Monroe, Madison, Washington, Randolph, Lake, La Salle and Clark streets. The Wells street Cable Cars will take passengers right to our factory; the Clark street cars carry passengers within two blocks of our establishment. Intending purchasers will find it to their interest to call on us and examine our goods before buying elsewhere. This growth has been not only a remarkable but a healthy one; it demonstrates more forcibly than words can tell, the popularity and superiority of our goods. It is a cordial endorsement of the generous policy of the house and its straightforward business methods. Our factory is the largest and most complete of its kind in the world, and we say this without making any reservation whatsoever. It is most systematically arranged for the highest grade of work at a minimum cost, and in its equipment of labor-saving machinery it cannot be surpassed. Kochs barber chairs are made with high quality materials, that’s why they are reputable. 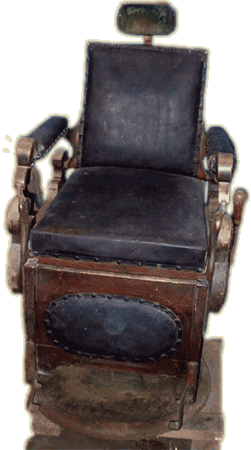 Before the turn of the 20th century, most of the company’s barber chair designs were made of wood (mostly Walnut, Cherry or Mahogany) with elaborate ornamentation. The earlier models, which were plainly named No. 9, No. 5 or No. 25, had a separate footstool. These models didn’t have mechanisms for adjusting the height, so the company charged extra for an accessory to raise the seat. One interesting model was Kochs Folding Barber Chair No. 40. It was made of Oak and upholstered in Velour plush. The upholstery was trimmed with fringes and the cloth-covered back was enameled. Due to its folding design, it occupied little space and only weighed less than 25 lbs. The chair was intended to be transportable; to be used by soldiers or barbers who travel the country during the Summer. Aside from barber chairs, Kochs also sold barbers’ furniture such as stools, barber poles, mirror and dressing cases, mug cases, shelf cases, cabinet brackets, work-stands, wash-stands, hall racks, towel cases and looking glasses. Almost all of their models have remarkable engraving that’s typical of the Kochs brand. Modern Kochs barber chair designs (1903 Catalog) can be viewed at the Smithsonian Libraries website. I have my grandfathers Theo Koch 1920’s chair. It is in fine working condition though I took it apart to clean it up. All is fine though am not sure if there were any seals in the hydraulic system for none were found. I can find no information on this. The piston and such have a grove though no seal was within. Did they deteriate or were there none from the beginning? Was it simple packing type material? The bottom end of the system was like jelly so cleaning it should take care of all prior issues. Leaking after assembly is my concern. Also, what oil should I put back into it? Again, I do not think the chair needs anything though am unsure. Need to check before I put it back together. Is there a way to find out how old a Theo-Kochs Barber chair is? I’m trying to find out information on the swivel brake for a 1950s Koch barber chair. Does it use a butterfly brake? Where would it be installed? I have recently acquired a 1950s chair and the only things it really needs are: Swivel brake, new armrest bracket for the back of the left armrest and a headrest to make it complete. Any information pertaining to the brake would be most appreciated. The armrest bracket was broken at one of the screw holes. I’m wondering if the one I have could be welded back together to repair it. I have a mobile barber or manicure stool. My chair has the number “58148 stamped under the seat. Is there any way to find out when it was manufactured. It is solid wood base – not hydraulic. Resting in our garage for many years, our 1903 (we think) Theo A. Kochs barber chair has a cracked foot rest and broken support bolt for one of the porcelain arm rests. Otherwise, the chair is in good working order. The nickel plating needs restoration, as well as the porcelain on the remainder of the chair. Still have the head rest. Would be interested in selling or restoring. Photos available. Thanks.